Unless you're one of those guitarists or bassists who flat-out refuses to consider digital effects, it’s worth comparing the merits of multi-effects pedals with traditional pedalboard setups, before deciding which type to buy. The purpose here is not to advocate either option, but just to present the advantages and disadvantages of each. For those who have a tendency to hammer their electric or bass guitars with a heavy attack, or can't play consistent rhythm parts throughout an entire song, a compressor might be the solution. 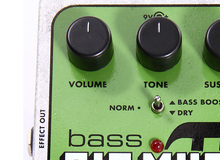 A compression pedal might also prove to be very practical in many cases when you want boost the volume of your instrument or add sustain.